Have you ever wondered what it would be like to be standing at the base of a launch pad when a powerful rocket ignites for the heavens? It’s a question I get from many kids and adults. So check out the fabulous video from my friends Mike Barrett and Jeff Seibert- and feel the power of the mighty SpaceX Falcon 9 which just rocketed to space on March 1 from Space Launch Complex 40 on Cape Canaveral Air Force Station, Florida. Mike and Jeff set up a series of video recorders distributed around the Falcon 9 Launch Pad – for a ‘You Are There’ experience. Well although you’d enjoy the awesome view for a split second, the deafening sound and fury would certainly drive you mad, and then leave you dead or vegetabilized and wishing you were dead. The cameras get creamed in seconds with mud, soot and ash. How is this view possible? Those of us media folks lucky enough to cover rocket launches, usually get to visit around the pad the night before to view the behemoths up close – after they are rolled out and unveiled for liftoff. We also have the opportunity to set up what’s called “remote cameras” spaced around the pad that take exquisite images and videos from just dozens of yards (meters) away – instead of from ‘safe’ distance a few miles (km) away. The cameras can be triggered by sound or timers to capture up close sounds and sights we humans can’t survive. After a shaky start, the SpaceX Dragon cargo resupply capsule launched atop the Falcon 9 safely docked at the International Space Station on Sunday, March 3. Maybe we’ll see you there ! 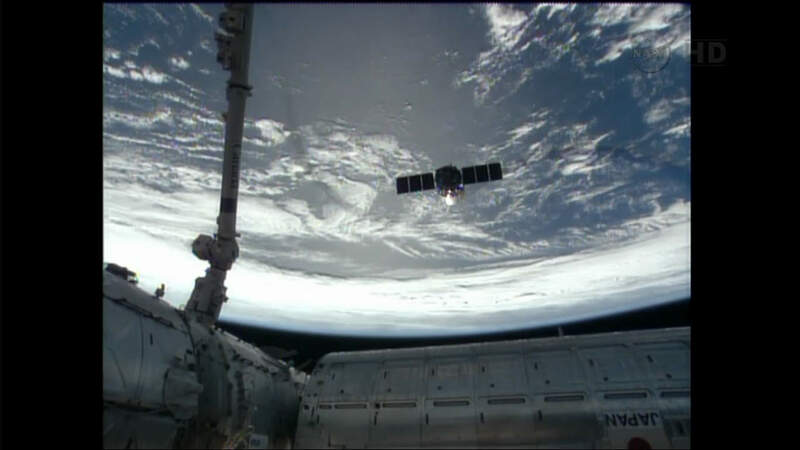 Just in from SpaceX and NASA, here’s a video of the descent of the Dragon capsule on the morning of May 31, 2012. Taken from a chase plane, the footage shows the spacecraft’s dramatic chute deployment and splashdown into the Pacific at 8:42 a.m. PT, approximately 560 miles southwest off the coast of Los Angeles. The event marked the end of a successful and historic mission that heralds a new era of commercial spaceflight in the U.S.
Read more about the completion of the first Dragon mission here. View from the Dragon spacecraft as it orbits the earth. This shots shows the opening of the guidance, navigation and control door. Credit: SpaceX. SpaceX's Falcon 9 on the launchpad. Credit: SpaceX. Today’s (May 19) historic launch of the first ever privately developed rocket bound for the International Space Station (ISS) was very surprisingly aborted at the last second when an engine glitch forced a dramatic shutdown of the Falcon 9 rockets 1st stage firing already in progress and as the NASA launch commentator was in the middle of announcing liftoff. SpaceX and NASA are now targeting liftoff of the mission dubbed COTS 2, for Tuesday, May 22 at 3:44 AM EDT from Space Launch Complex-40 on Cape Canaveral Air Force Station in Florida. There is another launch opportunity on May 23. Later today, SpaceX engineers determined that a faulty valve caused the engine abort failure. 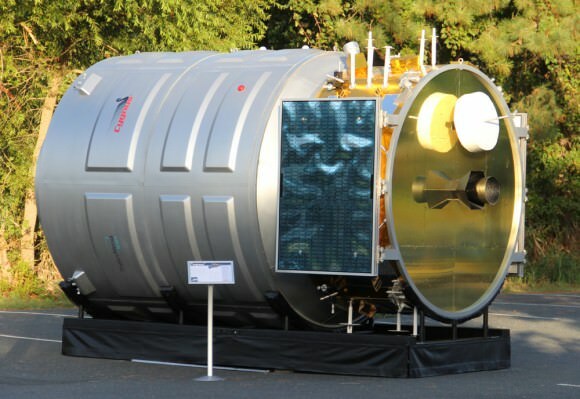 They are now in a race against time to complete all the repair work and mandatory assurance testing required in order to be ready to achieve the new May 22 launch date. The Falcon 9 rocket was designed and developed by SpaceX and the first stage is powered by nine Merlin 1 C engines. As the countdown clock ticked down to T-minus zero, all nine engines ignited. But engine #5 suddenly developed a “high chamber pressure” and computers instantaneously ordered a shutdown of thrust generation by all nine engines just 0.5 seconds from liftoff and the rocket therefore never left the pad, said SpaceX President Gwynne Shotwell at a briefing for reporters. After draining the explosive propellants, SpaceX engineers began inspecting the engines later today within hours of the aborted liftoff to determine the cause of the rocket engine malfunction. SpaceX may have caught a lucky break by being able to fix the rocket at the pad instead of a time consuming engine changout. Shotwell said that one possibility was to roll the Falcon 9 rocket back into the processing hangar and swap out the engine with a new one. This evening SpaceX announced they had determined the cause of the engine failure. SpaceX Falcon 9 engines ignite and shutdown at T Minus 0.5 seconds during May 19, 2012 launch abort at Pad 40 at Cape Canaveral Air Force Station in Florida. The purpose of Dragon is to carry some 1200 pounds of supplies up to orbit and dock at the ISS and partially replace the capabilities of NASA’s now retired space shuttle. SpaceX is under contract with NASA to conduct twelve resupply missions to carry about 44,000 pounds of cargo to the ISS for a cost of some $1.6 Billion.